XF Drugs have been shown to rapidly kill bacteria by interfering with the properties of the surface of bacteria, resulting in the loss of vital components from the cell, without bursting the cells themselves. XF Drugs have been shown to kill bacteria in all growth states, including non-growing cultures which are resistant to a large number of antibiotics, which depend on the bacteria actively growing to be able to kill them. 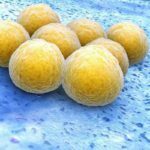 In addition, XF Drugs have demonstrated the ability to kill Staphylococcal bacteria within biofilms – unlike most antibiotics. XF Drugs have in vitro bactericidal activity against a wide range of bacteria. They have been shown to be effective at killing a wide range of Gram positive aerobic bacteria such as Staphylococcus spp. (multiple strains of MRSA, methicillin-susceptible S. aureus (MSSA), Staphylococcus epidermidis), Streptococcus spp, Corynebacterium spp. and Enterococcus spp. They are also active against Gram positive anaerobic bacteria such as Clostridium difficile and Propionibacterium acnes, and against some Gram negative aerobic and anaerobic bacteria.